Ok, ok…so I haven’t exactly stuck to the goal of reading two books per month. I’m not beating myself up over it though. At least I have some books that were completed by the end of the year!! That puts me at about one book per month. I’ll take that. Especially since I had work, school, plus the holidays in the mix with everything else. Any one of these books would be great if you are looking for something to read next. I loved Live, Love, Lead. I love the ministry that is Hillsong and thought this book was phenomenal. The Pastor’s Kid was a book that I had originally purchased to read as a preview and possibly pass on to Allie. I ended up reading it and passing it on to Otis. It had some great points in it, but I don’t necessarily think that Allie needs it at this point in her life. 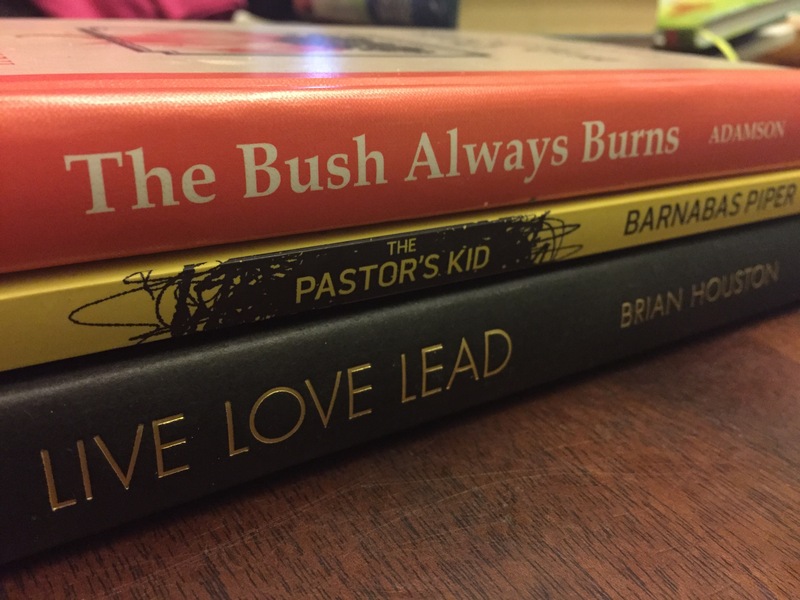 The Bush Always Burns was the first book that I read out of these three and it took me the longest. It also had a great points and encouragement. I did find it not as easy to read- but I’m sure that is just a reflection of my personal style and preferences. If you are like me and you keep a steady flow of books in your Amazon cart, go ahead and check out one or all of these titles if they peak your interest.